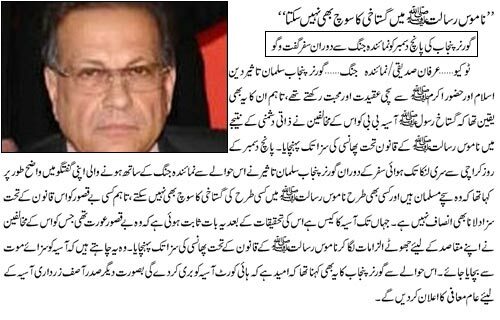 Chagatai Khan: Misuse of Blasphemy Law on Non-Muslims & Muslims. Those who have set a Human being on Fire should read The Prophet Mohammad (PBUH) who has forbidden burning people with fire. He said, "Lord of fire is the only One Who can punish by fire. ", narrated by Abu-Dawud and al-Dârimî. Wednesday, July 04, 2012, Shaban 13, 1433 A.H.
March 2010 Muslims desecrated Holy Quran in these Riots in Faisalabad, Punjab: Milad processions also attacked in Faisalabad, Sargodha Seven killed in DI Khan violence Monday, March 01, 2010 DERA ISMAIL KHAN: Police and security forces on Sunday arrested over 100 suspects in a swoop launched after sectarian clashes during the Milad-un-Nabi procession and, subsequently, between protesters and the police in Dhaki village. The two clashes left seven people dead and many others injured. The situation remained calm and under control after Saturday’s violence in Dhaki, some 50 kilometres from the Dera Ismail Khan city.The authorities had enforced curfew from 6:00 am to 4:00 pm and took strict security measures to avert any further untoward incident. At least, seven people were killed and 32 others sustained injuries in the violence and clashes between the protesters and personnel of police and security forces. Eyewitnesses said that a procession was taken out from the Bilal Mosque in connection with the Eid Milad-un-Nabi (PBUH) in Dhaki village on the Dera-Chashma Road. After covering some distance, the students of a seminary of another sect blocked the road for the procession and did not allow them to proceed.The situation worsened when participants of the procession and the students exchanged hot words. Subsequently, the sources said, the religious students started firing at the procession in which Muhammad Irfan Kanju was killed on the spot while nine others sustained injuries.Some of the wounded persons were identified as Muhammad Abid, Jehanzeb, Muhammad Naveed, Mumtaz and Ijaz. The sources said the students involved in the firing on the procession fled after the incident.However, the members of the procession took out a protest rally as a large number of people from the nearby villages thronged the place and joined the protesters. Eyewitnesses said a fierce clash between the enraged protesters and the police erupted after the former attempted to block the road and set the seminary and the house of the cleric heading it on fire. The police, led by District Police Officer (DPO) Gul Afzal Khan, tried to stop the mob by blocking the road.However, the protesters did not disperse, which forced the police to use batons and fire teargas shells at the protesters. The protesters, the sources said, reportedly opened fire on the police in which Sepoy Sanaullah of the Elite Force, Sepoy Asmatullah of Paharpur police station and the DPO’s security guard Tahir sustained injuries. The sources said the police and protesters exchanged heavy fire in which six people were killed and 32 others were injured.Those killed included Muhammad Hanif, Azizullah, Hafiz Alam Sher, Sanaullah, Hashmat Ali and Ahsan. Some of the wounded persons were identified as Muneer Ahmed, Kifayat, Muhammad Ramzan, Naseer Ahmed, Muhammad Yousaf, Zafar Iqbal, Ghulam Dastagir, Khadim Hussain, Mehroban, Gul Sher and Fida Hussain. Most of the injured were admitted to the DHQ and Paharpur hospitals while the seriously-wounded persons were shifted to various hospitals in Islamabad, Multan and Peshawar. Maulana Zahid Mahmood told journalists in police custody that the participants of the procession allegedly pelted the main gate of Gole Masjid with stones and used abusive language. According to sources, Gole Masjid Ghulam Muhammadabad was considered the main centre of banned Sipha-e-Sahaba. FAISALABAD: Some unidentified persons opened fire on Eid Milad-un-Nabi procession near a mosque in Ghulam Muhammadabad on Saturday afternoon, injuring at least four persons seriously. Infuriated participants of the procession blocked the road by setting tyres on fire and later attacked the Ghulam Muhammadabad police station. They pelted stones and torched vehicles parked on the police station premises. More than 100 vehicles, including impounded vehicles, wagons, motorcycles and cars and motorcycles of the police officials, were set ablaze, while the criminal cases record of the police station was also burnt to ashes. However, a local official denied the earlier reports about torching of 150 vehicles and motorcycles. He confirmed that 50 vehicles and 10 motorcycles and record of the police station were gutted during the incident. When the fire-brigade staff reached the police station, the furious religious workers pelted them with stones. The police have reportedly arrested four persons on charge of involvement in firing on Milad-un-Nabi procession and damaging the public property. However, their names were not disclosed by the police. After setting on fire the police station record, the protesters ransacked the house of Maulana Zahid Qasmi, looted valuables and set his house on fire. This caused serious damage to a gas pipeline in the area, which resulted in burning of a nearby house and two cars parked along the road. The furious protesters also burst into the Madrassa run by Zahid Qasmi, but the police took prompt action and got vacated the building. 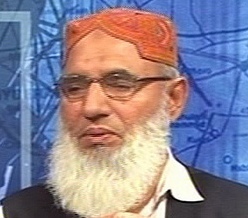 Meanwhile, both factions of the Jamiat Ulema-e-Pakistan, Sahibzada Fazle Karim faction and the Rasool Group, announced to observe a complete strike in Faisalabad on Sunday against the incident of firing on Milad-un-Nabi procession and asked the trade organisations to close down their businesses on Sunday against the incident. The JUP leaders also announced taking out protest rallies in Faisalabad and stage sit-ins at various points, including Ghanta Ghar Chowk. Police have registered a case against 25 persons, including 15 top activists of different sects under 7-ATA and various sections of the PPC. The police have also arrested 10 people, including Maulana Ziaul Qasmi, general secretary of the International Khatme Nubuwwat Movement. 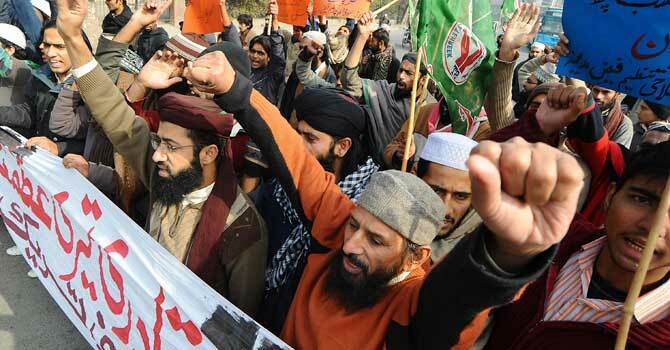 Meanwhile, religious scholars staged a protest to condemn the attack on the house and seminary of Jamia Qasmia. The eight bazaars were closed as the protest demonstration entered the downtown area. 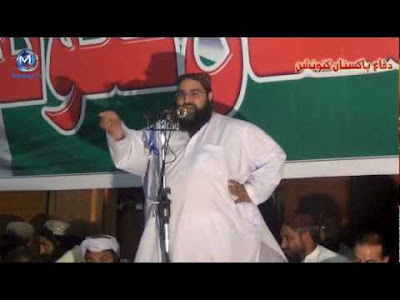 Addressing the protesters at Ghanta Ghar Chowk, Maulana Ahmed Ludhianvi and Maulana Ilyas Chinioti termed the incident a conspiracy against peace of this city. 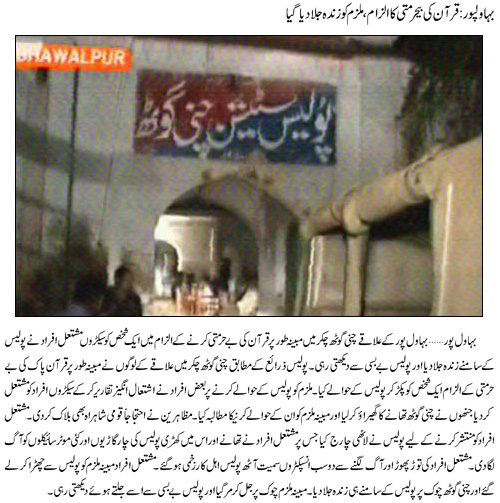 Meanwhile, the Khurrianwala police have also booked 12 activists on the charge of displaying arms on Eid Milad-un-Nabi. Those booked included Bilal, Tanveerur Rehman, Naveed Zafar, Saleem, Naveed Taj, Rizwan Afzal and Abdul Ghafoor. 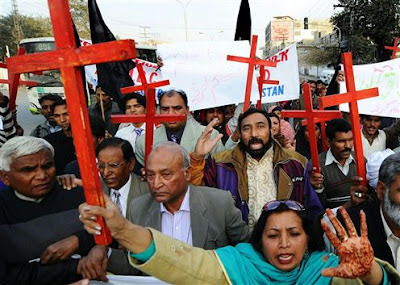 March 2010 Muslims desecrated Holy Quran in these Riots in Faisalabad, Punjab: Second Editorial: Religious intolerance An attack on Eid Milad-un-Nabi Barelvi processions in Faisalabad and D I Khan, retaliation by the participants and the subsequent damage to public and private property, loss of life and injuries have revealed that religious intolerance is seething just beneath the surface. In such incidents, the first suspicion is cast upon the opposing sect, who might normally have been assumed to be Shias in this case, but the Barelvi victims have accused the Deobandi groups in their respective areas. The occasion of Eid Milad-un-Nabi in Pakistan is usually marked by celebrations comprising lighting up of streets, model-making, na’at competitions and processions in all big cities. The Barelvis, more rooted in the culture of the Subcontinent and deeply influenced by Sufism, have always promoted the more human side of religion by spearheading celebrations of the birth of the Prophet (PBUH). Fun-starved youngsters make full use of the opportunity to give vent to their artistic skills and provide healthy entertainment to the general public. However, this has irked the conservative schools of Sunni Islam, notably the Deobandis, who had been campaigning before the occasion that celebrating the birth of the Prophet (PBUH) was a heresy because neither he nor his companions celebrated the event. The eruption of violence on such an insignificant issue between two Sunni denominations is an indicator of deep insecurities and a wish to impose one’s interpretation of religion on all others.